If you’re anything like me, you love Valentine’s Day. This day represents the one thing this world needs more of: love. Love for friends, family, even pets. But after the holidays, I am literally broke. Hence, do-it-yourself gifts are given to my husband, family, and friends. I feel that they enjoy a hand made gift from me even more than a store bought gift. So here are a few suggestions to get you jumping on the DIY train. Side note: these gifts are great for men and women, boys and girls. They can be given to your kids or parents. Valentine versatility … that was my vision while looking for gift ideas. Hope you agree! 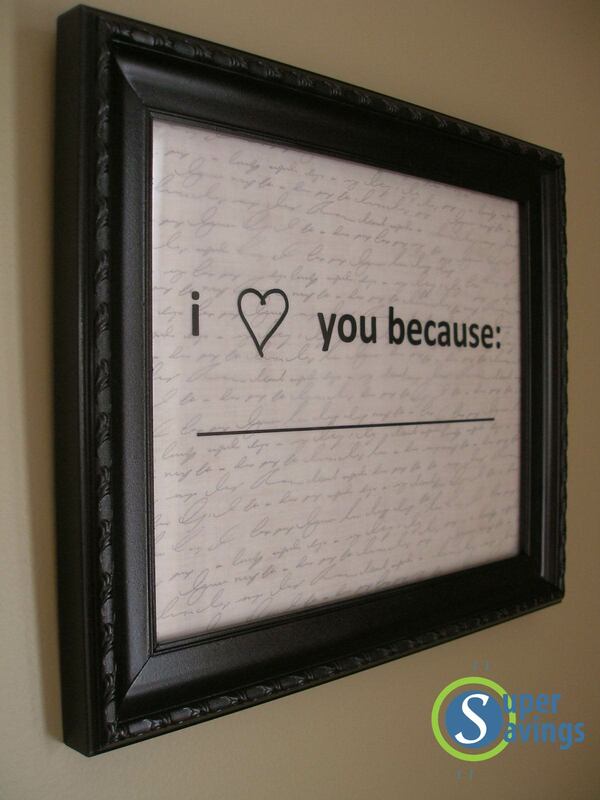 The first idea I wanted to share is a frame that you can write little love notes on for your significant other. 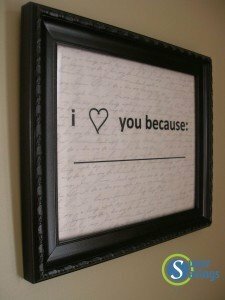 It’s an “I love you because” theme, and personally, it is one of my favorites. I’d stick this in the bathroom for my husband to see when he wakes up in the morning. Just to put a little extra pep in his step. Who doesn’t want to see a little love message first thing in the morning? I really like that it’s on the little frame, it looks classy and cute. You use a dry erase marker to write your note, then you can easily erase it at the end of the day, and write another one for the next day. Super simple, inexpensive, and thoughtful. Check it out by clicking here. 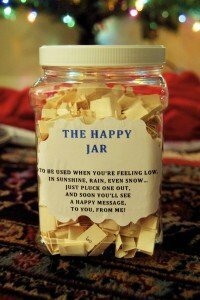 The next idea is a jar full of nice little notes for your honey. I like that the person in the article mentions that she picks out of it when she’s having a bad day, and it instantly brightens her mood. We all need a little pick me up here and there. I would personally do a mason jar and maybe tie some burlap ribbon around it, just to make it cuter. Maybe even a little lace. I love the country look of mason jars, burlap, and lace (probably because I’m from Texas). Take some time to personalize it, and have fun with it. Then all you have to do is write little love notes, jokes, or Bible verses – whatever your heart desires. I’d keep mine in the kitchen so I could pull one out to read while I am drinking my nighttime cup of milk. 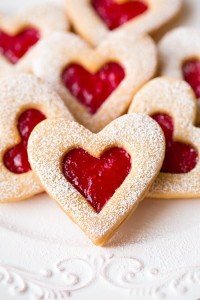 This gift is so easy to make and it carries through long after Valentine’s Day. Check it out by clicking here. The last option for you is obviously cookies. You can’t have Valentine’s Day without a little sugar. These are some of my favorite cookies, so trust me, because I am the champion cookie taster of the universe. No, but seriously, these are delicious, and you can use any flavor of jam you like. I love the heart shape of them, too. You can wrap them up in fun bags and finish off with a curly ribbon. These would be cute to send to your kids’ teachers, give to your hairdresser, or your favorite person in Student Services (hint hint). No one refuses these cookies. And they’re so easy to make. Double win in my opinion. Check it out by clicking here. Valentine’s Day doesn’t have to be super expensive. If you look back through the history of Valentine’s Day, it was customary to give little handwritten cards. I personally love the idea of handmade gifts. It means so much more to me than anything you can buy in a store. It’s all about trying to figure out what to make. I hope this has given you some fun ideas to show the ones you love that you care for them. And I hope you have a very happy Valentine’s Day.